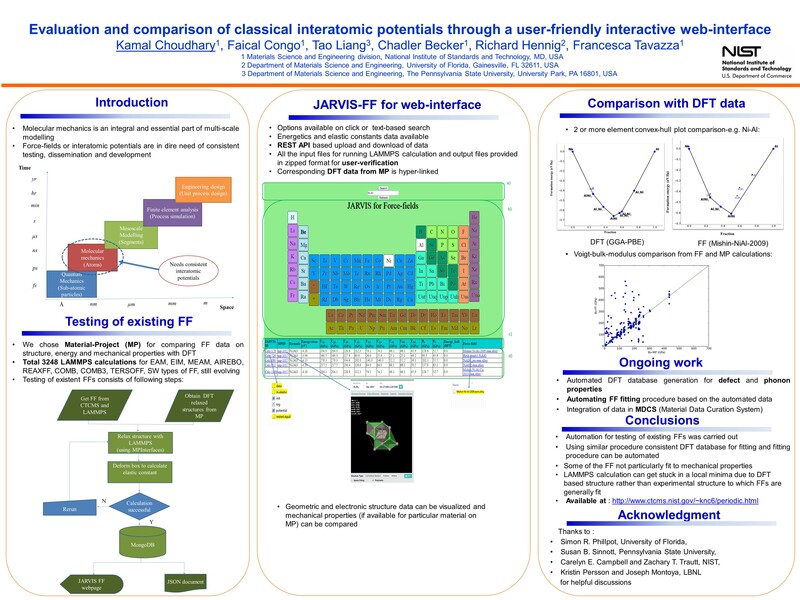 JARVIS-FF is a database designed to help Molecular Dynamics and/or Monte Carlo users to choose the classical empirical potential that is right for their simulational needs. At the moment the database consists of 3128 entries among energetics and elastic property calculations, and is currently being expanded to include surface and defect-related properties as well as phonon-related data. All these properties are computed for all empirical potentials available to LAMMPS users or deposited into the NIST Interatomic Potentail Repository (IPR), and are compared to density functional theory (DFT) as well as to experimental data, where available. The most notable characteristic of this database is its easy-to-use web-interface that has been designed expressly to facilitate direct comparison between potentials. This is accomplished through clear look-up tables that allow to compare at a glance the results from different potentials for the same or similar systems. Lastly, both the complete database and the software coding used in the process have been released for public use online (presently at Github) in a user-friendly way designed to enable further material design and discovery. Structural data: we downloaded all the available potentials from the NIST interatomic potential repository (IPR) and from LAMMPS itself (15May2015 version). For each element having at least a potential, we downloaded all the corresponding crystal structures from the Materials Project (MP) database. We also downloaded all the energetics and mechanical properties data from MP for comparison purposes. High-throughput calculations: The high-throughput setting of the LAMMPS jobs was done using the MPinterfaces. Using such a framework, for each force field and structure we calculated the energetics and 21 distinct elastic constants using the script provided in the LAMMPS distribution version 15May2015. Using the energetics information for each material, convex hull plot were drawn using the package provided in Pymatgen (script named PDPlotter.py). All the input and output data for the calculations were saved in zipped and JSON format files and are available on the website. User-interface: The data is presented in an interactive periodic table format. The four major aspects of our web interface are as follows first (panel a)) is the search box, where the user can type the element or element combination of interest. The interactive periodic table that appears as the web page is opened is shown in panel b). Here the user can input the query by simply clicking on the element or element combination of interest. Panel c) shows the header. The last panel (d) contains the actual data for all the quantities discussed in the header section. These data are interactive in nature, as, for instance, clicking on the “Calcs” tab downloads the zipped input and output files of the LAMMPS calculations. Code Availability: The code is written in python and it is publicly available on Github . Reproducibility and Technical Validation: All the data in the database is intended to be reproduced very easily, as they were obtained by running the publicly available code LAMMPS and all the used input files are available for download from the zipped folders stored on the web for each calculation. To validate the FF applicability, the elastic constants and cohesive energy data of each structure are compared with those obtained using DFT. These DFT data were taken from the Materials Project (MP). Derived Quantities: Thanks to the high-throughput nature of Jarvis, the user has a multitude of data available for the material/structure of interest. Interesting derived quantities can then be obtained, as, for instance, convex-hull plots that are used to know the phase stability of a material on the basis of composition and energetics information. The scripts for plotting muti-component convex-hull plot is provided at the Github page. Data analytics: Data analytics tools provide the opportunity to determine correlations in data sets that can illuminate the accuracy of predictions and the flexibility of underlying models. As an example, to investigate if there are any trends in the elastic properties predicted by the various potentials, we used the data in Jarvis to perform a principal-component analysis on the relative errors of the predicted elastic constants compared to experimental data experimental data for the four FCC elements with the largest number of available potentials, i.e. Al, Cu, Ni, and Ag. The research paper for JARVIS-FF has been submitted to journal and will be available soon.